A vast ancient tomb unearthed in northern Greece this week most likely belonged to a prominent Macedonian of the era, the Greek government announced. Distinguished by two sphinxes and frescoed walls and dating to 300-325 BC, there has been speculation that the tomb could contain the remains of Alexander the Great or his lawful Persian wife Roxana, and their son Alexander IV. The tomb, in the country’s north-eastern Macedonia region, has been gradually unearthed over the past two years. A culture ministry official said that there was no evidence yet to suggest a link to Alexander the Great. Alexander the Great died in 323 BC in Babylonia – modern day Iraq – and his actual burial place still remains unknown. 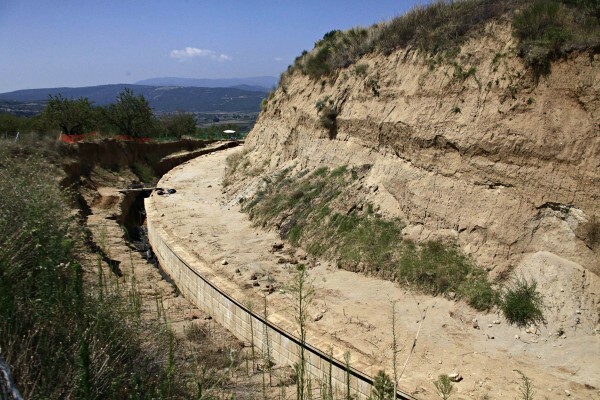 The official said the Amphipolis site, about 105 kilometres north-east of Thessaloniki, near the town of Serres, appeared to be the largest ancient tomb to have been discovered in Greece. Archaeologists expect to enter the tomb by the end of the month to determine who was buried there. “It looks like the tomb of a prominent Macedonian of that era,” said another culture ministry official last week. The findings so far include two sphinxes, thought to have guarded the tomb’s entrance, and a 4.5 metre-wide road leading into it, with walls on both sides covered by frescoes. It is circled by a 497-metre marble outer wall. Experts believe a 5.2 metre tall lion sculpture, previously discovered nearby in an excavation that began in 1960, once stood atop the tomb. According to archaeologist Katerina Peristeri, the head of the 28th Ephorate of Pre historic and Classical Antiquities, excavations over the last two years at Kasta Hill in Amphipolis have revealed a unique grave circle which dates back to the last quarter of the 4th century BC. Greek Prime Minister Antonis Samaras, who visited the site this week, described the discovery as an ‘extremely significant finding’. “The land of Macedonia continues to move and surprise us, revealing its unique treasures,” Greek Prime Minister Antonis Samaras said. “Everything we have been shown by Mrs Peristeri and her team underline the significance of the findings. It would be wrong of us to be tempted to start speculating,” he told the Greek daily Kathimerini. Ancient Amphipolis was founded as an Athenian colony in 437 BC and was conquered by the father of Alexander the Great, Philip II of Macedon in 357 BC. There has been speculation that the tomb could contain the remains of Alexander the Great or his lawful Persian wife, Roxana, and their son Alexander IV. Roxana and Alexander IV were murder by Cassander, in 311 BC, after been exiled to ancient Amphipolis, located on the banks of the river Strymonas. Cassander was a Greek Hellenistic King of Ancient Macedon (305-297 BC), who married Alexander the Great’s half-sister Thessaloniki and founded the second largest today Greek city, Thessaloniki, named after his wife, in 317 BC. The most famous ancient site in the region of Macedonia so far is the Vergina Tomb of Alexander’s father, Philip II, which was unearthed in 1977 by the late professor Manolis Andronikos.